You don’t have to be a lawyer to appreciate Suits. I, for one, fell in love with yet another foreign TV series. If Americans can create witty comedy-drama series, why Pinoy TV can’t produce shows of this caliber? Something exciting. Edifying. Mind-boggling. Refreshing (i.e. a show not entirely focused on romance.) Nah, I’m not bitter. Why watch Suits? It portrays brilliant characters facing real dilemmas, blunders, and everything else that put to test their true grit. If you’ve enjoyed tandems in other hot TV series like House and Wilson (House M.D. ), Leonard and Sheldon (Big Bang Theory), and Charlie and Larry (Numb3rs), you’ll be absolutely fond of Mike and Harvey’s (it doesn’t hurt they’re both gorgeous,hehe). 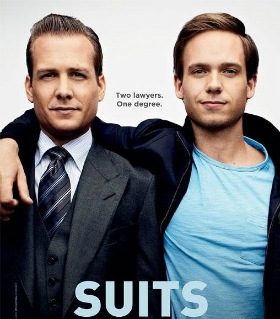 Mike Ross, a law exam genius but not even a Harvard grad nor a degree holder, was picked as an associate to New York city’s famous closer and one of its top attorneys, Harvey Specter. Do you expect Mike to easily survive in high-profile law’s cutthroat world? After watching 10 episodes in a row, I couldn’t sleep knowing I haven’t been working hard enough to live up to my potentials. If Mike Ross, a prodigy, has to work hard in order to succeed, how harder should I try? Yes, he’s a fictional character so his qualities were a bit exaggerated, but you get the drift, don’t you? Even the smartest has to persevere. Looking for hallmark-able quotes, clever to humorous scenes and conversations, and insights to the work world of lawyers? Then, try some Suits. Makes a yankee proud that you like our TV so much. And hard work pays more than talent. Every time. I know this from the other side, so keep working and someday I’ll be as good as you.